On my second day in the Mono Peaks area, I planned to do a longish ridge hike along the crest of Glass Mtn, tagging six summits in the process. The highpoint, denoted as Glass Mtn Ridge, is on the DPS list and a summit I had climbed seven years earlier. This year, late May snows had inundated the Sierra and other high summits (including 11,000-foot Glass Mtn) with snow after an abysmal winter season. I didn't realize how much of this was sticking around until I had driven over Tioga Pass the previous day and found more white than I was expecting. I had come unprepared with axe/crampons and was somewhat concerned that I might have to change plans. Luckily I had been looking at the north side which holds more snow while the other aspects carried less snow. I'd spent the night camped at Sawmill Meadow on the east side at over 9,000ft on dry ground. This was the side I would ascend, finding it snow-free until near the summit crest. Sawmill is about 2mi from, and 2,000ft below the north summit of Glass Mtn where I first headed. There is a use trail going up this side from where a road is shown on the topo map rising to the west a short distance from the main road. I had forgotten this detail and hadn't really researched it well before this trip so I ended up heading cross-country up steep slopes from where I'd parked. Intially the route travels up forested slopes but these soon give way to more open talus slopes. With the absence of trees, the views open up accordingly. I reached the crest in about half an hour, but still half an hour from the north summit (denoted as Glass Mtn, as depicted on the topo map). Snow covered most of the crest between Glass Mtn Ridge and Glass Mtn and there was no way I could get to Glass Mtn without crossing much of this. I followed a line dropping down to a drainage and up the other side in order to take advantage of snow-free sections found there. By the time I had to get onto the snow the gradient was much easier and the firm snow provided sufficient traction. There was some modest postholing but for the most part is was an easy walk. The summit holds some solar-powered communications equipment that while a detraction, is not so large as to be obnoxious. All around the summit was a gentle blanket of consolidated snow. Mono Lake can be seen in the distance to the north while the higher Glass Mtn Ridge rises about 60ft higher about 2/3mi to the south. My intention was to climb the north side of Glass Mtn Ridge but I judged that to be a little sketchy, with somewhat steep and hard snow that would not be so easy without crampons. After mulling it over, I decided to punt. I returned along the crest the way I'd come, then went up to a saddle just east of Glass Mtn Ridge. I might have been able to climb this easier but still significant slope which was also snow-covered, but by this time I had already given up on the highpoint of the Glass Mountain massive. Instead, I continued south along the ridge, tagging the various unofficially named summits found along the way over a distance of almost six miles. The hike was very enjoyable over easy terrain, though not without some significant gain (a total of about 4,000ft on the outing). Though there was still some snow below the higher two peaks, it was now possible to do the remaining hike without crossing any snow. Glass Mountain Ridge South lies less than a mile SSE of its higher sister, its highpoint located a short distance west of the crest itself, an easy detour. Crowley Lake is visible from the summit, lying at the base of the Sierra around the Hilton Lakes TH. A register had been left a year earlier from a rather large DPS party that was doing essentially the same hike, minus the visit to the northernmost summit. I counted some 25 names on the two pages, leaving my own lonely entry at the bottom of the second. More nice hiking ensued along the ridge with fine views off either side. I did not find a register at the next summit in line, Kelty Peak. Further on at Wilfred, I did find one, with the same names as those on Glass Mtn Ridge South. 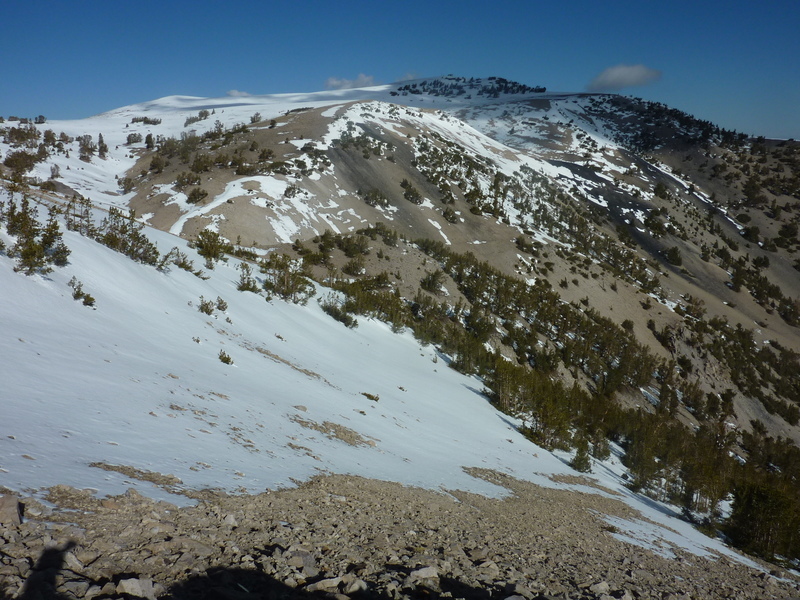 Though the last summit, Cone Peak, lies less than a mile SE of Wilfred, the distance to reach it is twice that since there is a large canyon separating the two summits. The cross-country along the crest ends soon after descending the NE side of Wilfred where one picks up an OHV road that climbs to the crest from the south at Benton Crossing Rd. Motorcyclists have ridden to near the top of Wilfred, but most enthusiasts seem to stay lower on the north side. An entire network of roads not shown on the topo maps can be found throughout this part of Glass Mtn south of the Sawmill Campground. I would use some of these on my return. I followed the road that clings to the crest as it curves around to Cone Peak, a side road leading up to a small clearing on its east side, just below the summit. The final climb is a short scramble up steep rock and talus where a rather large cairn marks the highpoint. A tattered MacLeod/Lilley register dates to 1992 with many, many entries. Most are from hunters and OHV enthusiasts riding along the crest, so I only bothered to photograph entries from those I recognized, including Andy Zdon, Laura Molnar, Bob Sumner, Brian French, Jonathan Bourne, Sue & Vic Henney, Paul & Keith, and the large DPS party that preceded me. After leaving the summit I headed north towards Sawmill and my car, using a combination of very easy cross-country and some of the aforementioned unmapped roads to find my way back, crossing over a several low ridges to get myself to the correct drainage and the Sawmill Campground. These two summits are found at the north end of the Benton Range, forming the east side of Adobe Valley through which SR120 runs. A high clearance vehicle can save several miles of hiking across Adobe Valley, but without such help I was relegated to a longer outing starting from near the highway. I found an informal campsite east of the highway among some rocks overlooking the south end of the valley, where "COW" benchmark is found on the topo map. Ranching appears to be popular in Adobe Valley, mostly BLM land with some private inholdings. Starting shortly before 2p, I headed downslope through knee-high brush and across Adobe Valley to the west side of Trafton. The brush wasn't cause for much concern because it could be avoided for the most part by bobbing and weaving through the stuff as one traveled. At the floor of the valley, nearly bone dry but some green present, I encountered a beefy fence here, well-maintained and likely still in use. No cattle were seen anywhere on the hike, conditions likely too dry from drought to graze them at this time. There was nothing tricky about the ascent up the west side of Trafton. I had planned to follow a lower-angled canyon up to a saddle to the north, but the more direct route did not appear to hold any difficulties upon inspection and I changed course to get there more quickly. The slope is steep however, climbing 1,200ft in less than half a mile. At the crest I realized the summit is still a short distance to the southeast and finally arrived there after about an hour's effort. I was pretty tired by this time and had half-decided not to pursue the longer effort to reach Antelope. Looking north I could see Antelope far off, almost three miles in a straight line. At three in the afternoon, that appears to be very far indeed. I rested some while I photographed the loose pages from a register left by MacLeod/Lilley in 2003. Brian French and Sue & Vic were among the few names I recognized. There were not enough pages to give me much of a rest and when I got up again I really didn't feeling like continuing to Antelope. I knew I would regret it if I didn't because much of the approach is the same as for Trafton - only further. I decided to head downslope to the north to see if I could get a better view to Antelope, kinda of a way of starting in that direction to entice me to continue. It worked. I spotted a road on the east side of the crest over by Antelope and thought that might be a way to make things easier. The range between Trafton and Antelope is split by a long canyon that runs across the crest at a diagonal. A transmission line runs along this valley as does a road built to service it. Forking off from this is a rougher road running around the east side of Antelope, eventually climbing to the summit. The only cross-country I needed to do between Trafton and Antelope was all downhill and this went fairly smoothly without any brush to contend with, mostly through forest understory. In all I spent about an hour and a half traversing the distance between the two, not half as bad as I had imagined. Antelope's summit is home to a small collection of communication towers. Some 20 pages of a register date back to 1993, though none of them contained an entry by the MacLeod/Lilley duo (turns out they climbed it in 1989, before the date of the current register). Next to the summit rocks is another alien space probe, the likes of which I've seen all over the state. I think the aliens must recognized that I was on to their invasion scheme because along with the register was a clever bit of propaganda describing the probe as a geophysical instrument designed to collect seismic and geospacial information for the betterment of mankind. They have clearly learned much of our civilization, having mastered the scientific gobbledy-gook way of writing to describe such things. Rest assured, I have not been taken in by their attempts to distract me. I know these things are up to no good.